Recently I heard the phrase, “Like faith and practice.” The context was one church would not associate with another church because they did not practice their faith in the same way. I can guarantee you that is the complete opposite of brotherly love. That borders on hate for your fellow brothers and sisters. Not to mention it is anything but humility. I believe that loyalty is a key ingredient in any friendship. We all want and need someone to count on, especially in difficult times. But we should also beware of acquaintances that always often praise us and tell us what a good friend we are. True friendships do not depend on such antics – especially if this person wakes us up to do it! Yes, love is always sensitive to other people’s feelings and needs but at the same time, true friends will always say the right thing at the right time in the right way. 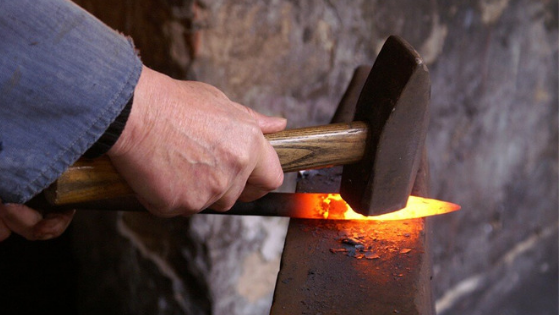 Sharpening iron with another iron involves striking, friction and sparks. In the same way, a man can be used to improve and develop his friend, but it may happen through a bit of friction and sparks. And when this happens to us, we must not shy away from critical and constructive criticism. We need Christian friends to not only pray for and with us but also to listen, counsel or rebuke us when needed. But sometimes a friend’s counsel may not be perfume but acid. Sparks may fly, but God will give us the light that we need. The problem with “disagreeing” is that some people tend to go too far. Do you know that independent Baptists pride themselves for being independent of any church hierarchy? Each individual church makes their own decisions without influence from other congregations. I believe that is biblical but can this independence be taken too far? At what point do we sacrifice our pride so that we are able to rub shoulders with Christians that have different views? Or does our independence help us build echo chambers because we don’t allow differences of opinion or practices to challenge our beliefs? Then I thought about it. Jesus told us to love even our enemies in Luke 10:25-37. But many Christians today tend to look down with their pointed noses on other believers because they live differently. The same is true of churches. They have their own list of church rules or standards and try to force them on other people or churches. Why do some Christians and churches feel superior over others who do not hold to the same standards as theirs? Should we only consider brethren those who live their lives exactly the way we do? Someone once asked Christian apologist Ravi Zacharias why there are so many sects or denominations of Christianity. In this video, Dr. Ravi Zacharias explains how unity in beliefs does not always mean uniformity of expression using Roman Catholicism as an example. Romans 14:12 says we are accountable to God. This we are only responsible to Him as well. We have no right to tell others how to live their lives or to think we are better than a different body of believers. Personal standards of individual believers are just that personal. They are only between the individual and God. Isn’t it time we stop hating our brethren and living out the love of Jesus? As the Jews hated the Samaritans, we are doing the same thing over petty practice differences. Are we not playing for the same team? This individual I know even admitted “like faith” between the two churches. At what point are we going to love our brethren and local bodies to the point of trying to encourage and sharpen believers that are different from us? Isn’t it time to lay down our differences and actually work together? What a novel idea?